I am not even going to mention the official definition of income. Look it up in an official-looking accounting book if you so choose. Income is simply the event that results in money flowing into the business. Each one of these things above represent some sort of event that occurs (like a sale being made), which results in money flowing into a business. More income means more profit, which means more for the owner. Income thus comes into being (and increases) on the same side as equity – namely the right side. Okay, let's return to George's Catering and see how George deals with income. e) Now George’s Catering provides catering services for a wedding. George gets $10,500 from this job in cash. 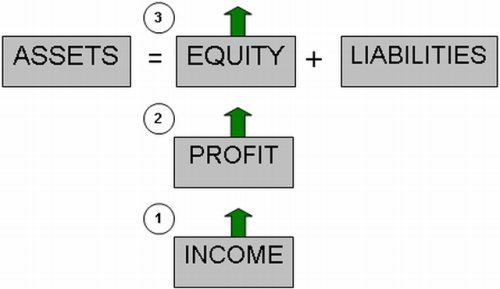 What happens to our accounting equation? Well, assets go up (on the left), because we have received $10,500 cash. That’s the simple part. The catering services itself is income, as it is an event that results in money flowing into the business. The business has thus made income, and this is worth $10,500. 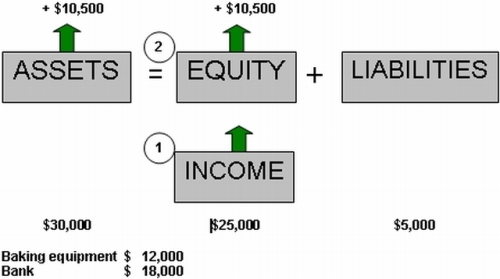 Income increases on the right (the same side as the owner’s equity) and causes the owner’s equity to increase by $10,500. The owner now has a stake of $25,000 of the total assets of $30,000. Once again, the external parties’ stake (liabilities) will be the same as it was before this transaction ($5,000). So, as you can see, income results in more assets, and in the owner having a greater share in the assets.